These muffins are always a huge hit in our home. They're densely packed with good-for-you ingredients like flaxseed meal, oat bran, carrots, apples, and raisins and are the perfect on the go breakfast or as an anytime snack (or dessert!). 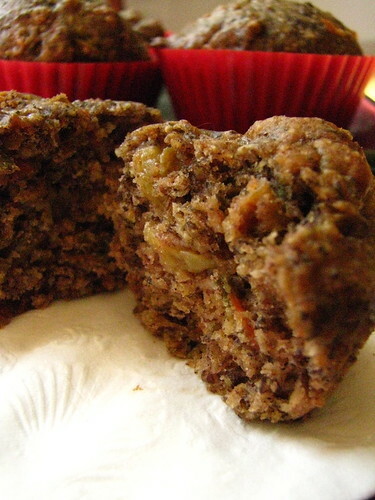 The shredded carrots and apple keep moisture locked in, so these are not they typical dry and crumbly oat bran muffin! I've even iced them with a simple vanilla cream cheese icing and served them as "healthy" cupcakes. Trust me, the kids loved them! In a large bowl, mix together all dry ingredients. Stir in carrots, apples and raisins. Combine milk, beaten eggs and vanilla. Pour liquid ingredients into dry ingredients and stir until ingredients are moistened. Do not over mix. Fill muffin cups 3/4 full. Bake at 350 degrees for 15-20 minutes, or until a toothpick comes out clean. *Variation: try a carrot-zucchini blend or chunk up a small banana along with dried cranberry raisins for other tasty versions. This looks yummy! I love easy recipes. Those muffins look great! I am always looking for nice healthy alternatives and this one is great! They are pretty good, I subbed raspberries for the apples. I found them a little dry, perhaps because i let them cook to long. I had to smear lots 'o butter on them. so- be careful not to over cook! !